From the Policy tab, you can move all endpoints assigned to one policy to another policy. Note: To move an individual endpoint to a policy, see Applying Policies to Endpoint Groups. From the Policy Name column, select the policy you want. The bottom panel lists which groups use this policy. Click the Move all endpoints on this policy to another policy icon. From the Policy drop-down menu, select from a list of policies and click the Save button. 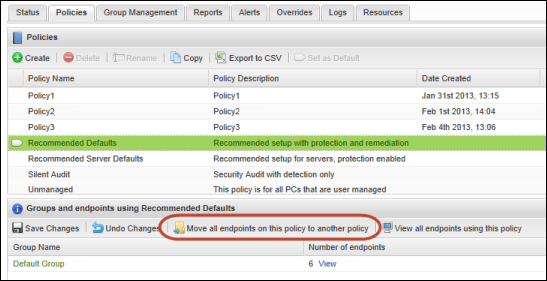 Check the Policies list to make sure the new endpoints are shown under the new assignment.